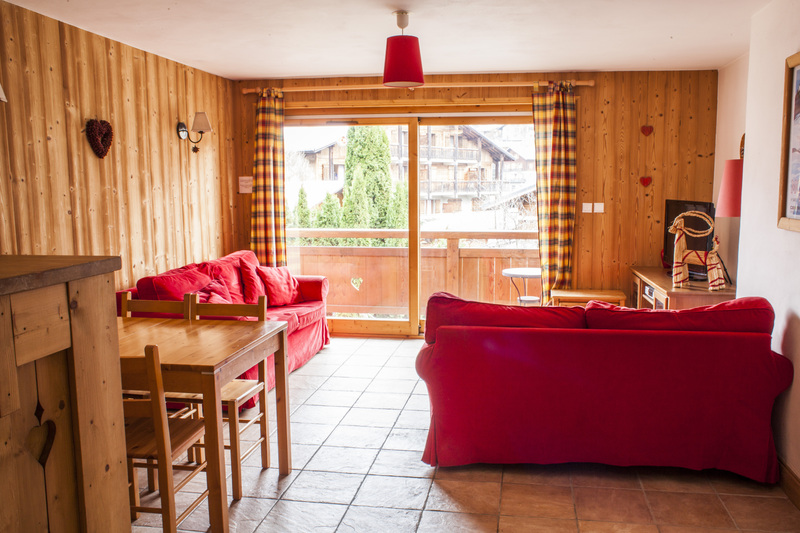 Ty Mynydd is located in the centre of Morzine and has been built and furnished in traditional Savoyard style. It has 2 bedrooms, comfortably sleeping 4-6 guests. This is a stunning apartment, the kitchen is fully stocked with all the essential equipment for your self-catering holiday, and is open plan to the spacious living and dining area. The small balcony enjoys gorgeous alpine views and is furnished with a table, chairs and a BBQ. Ty Mynydd is a beautiful 2 bedroom apartment with one double bedroom and one bunk bed room very conveniently located. Only a five minute walk to the ski lifts, swimming pool and central Morzine with shops and restaurants on its doorstep. This apartment is very well equipped with all the amenities you will require for a relaxing self catered holiday including a plasma TV, Wifi, parking etc. Wifi is a free service. We include a £200 security deposit in your balance invoice to cover any damages that may occur during your stay. Cots are provided free of charge. Cot Linen is also supplied, however you are welcome to bring your own. Highs are provided in the property on request, free of charge. Return transfers to and from Geneva airport. Cost based on per person/per seat. If you require a transfer pick up from somewhere else please request availability and price. Gourmet Meals - have restaurant quality food delivered to your door. A 2 course evening meal freshly prepared each day and left in your fridge for you to just heat and serve when you return from the slopes. Cost = £18.00/person/evening Available 5 nights a week (Mon, Tue, Thurs, Fri and Sat) Note - please enter how many meals you require in total throughout the week and notify us with which evenings you require. Lift Passes - if you would like to pre-book these so they are in the property on arrival, avoiding the first morning queues, please let us know. There is no extra cost for this service and you pay for the passes in resort either via card or cash. Please let us know if you require an adult/child or senior pass, the number of days and if it is to be a full area (PDS) or local area (Morzine/Les Gets) pass. Ski Hire - All Mountain Rental Please book your ski hire online with www.allmountainrental.com. They will offer you discount, deliver the equipment to your property for your arrival and collect again after you depart - very hassle free. Just select 'Morzine Ski Chalets' as your operator and then select the property you are staying in. You pay the ski hire company direct in resort. If you are part of a large group you can create an account and then everyone can book their own equipment. During the summer months only, there is an additional service/cleaning charge to use the hot tub in Chalet Sosa, Chalet Narnia and Chalet Chantelle. all self catered properties have a security deposit to pay which is returned after guests depart. A breakfast pack is a starter pack of food which will be in your property on arrival. cereal, tea/coffee, fruit, yoghurt, milk, bread, butter, jam. This is not a daily delivery service. This end of stay cleaning charge is for the summer months only. The cost = £40/apartment or £65/chalet.